Hyundai is promoting the Elantra’s auto emergency braking system with a preroll Youtube film with a difference. The Hyundai Preroll Skip Ad’s concept evolved out of peoples’ annoyance at pre-roll ads, and their tendency to skip them as soon as they pop up. Innocean made the “skip” button a distraction for the driver in their ad too. 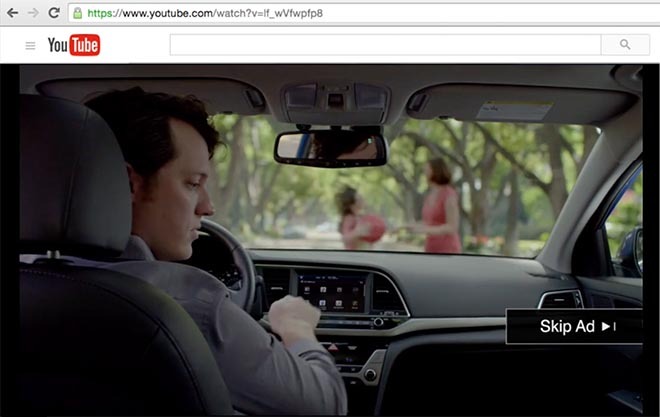 In “Hyundai Preroll Skip Ad” a persistent driver tries to rid the screen of YouTube’s distracting “skip ad” button. He almost hits a mother and daughter crossing the street, but with the help of Elantra’s auto emergency breaking, his car stops just in time. The Hyundai Preroll Skip ad was developed at Innocean USA by chief creative officer Eric Springer, group creative director Barney Goldberg, creative directors Jamin Duncan and Marcin Markiewicz, associate creative director/art director Charles Gerstner, copywriters Kate Steinberg and Jeff Barry, director integrated production Carol Lombard, producer Brad Johnson, head of account services Marisstella Marinkovic, group account director Lester Perry, account supervisor Allison Morrissey, senior account executive Tanner Ham, media planner James Zayti, head of strategy Frank Striefler, VP planning director Kathleen Kindle, PM Jamie Fink, business affairs team Ann Davis and Jade McAdams, working with Hyundai chief marketing officer Dean Evans, senior manager advertising Monique Kumpis and senior manager advertising collateral Woojong Kim.